Last week I watched a video online on how to make almond milk and posted about it in my Whole30 recap for the day. I was really impressed with how easy it was. 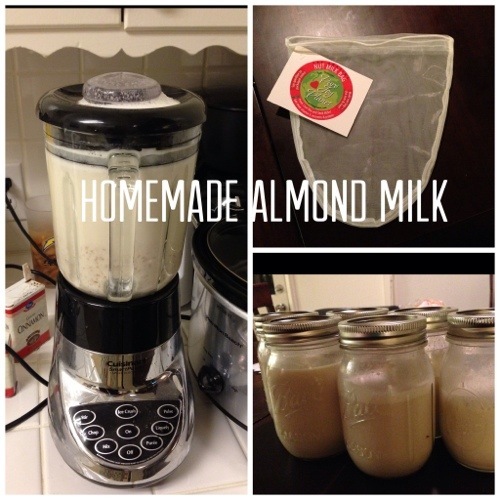 I have always wondered how to make almond milk on my own and this was a simple way to do it. Plus I’m on the Whole30 plan right now and we can’t have almond milk because of all the processed chemicals in the kind that comes in the carton. But it’s perfect acceptable to make your own almond milke! This is why I decided to research how to make almond milk in the first place. Raw, Natural Unsalted Almonds. I got mine from Trader Joe’s. When I first watched the video on how to make almond milk I got so excited about making my own almond milk that I went online and bought an almond milk nut bag. Yes, it’s called a nut bag and it looks like a pair of tighty whiteys. Pretty funny. It’s really fine so it doesn’t allow any of the almond particles to get through into your milk. You can also use a cheesecloth for this. All you need is a fine mesh strainer. I got the idea from the Lorna Jane video on How to Make Almond Milk that inspired this whole experiment. First , take one cup of almonds and soak them in water overnight. This helps soften them up for the blending process. After your almonds have soaked, drain them and put them in a blender along with 4 cups water. You want to make sure you have a good blender. I have a magic bullet which I love for pretty much everything blending related but it wasn’t really up for the task so I pulled out our Cuisinart Blender. Then add any extras you might want to put in there. I put cinnamon and nutmeg in mine. I wanted to put vanilla extract but it wasn’t whole30 compliant. Doh. Next time! Once the almonds and water have blended, put the nut bag or cheesecloth in the jar you are going to pour the milk into. Then squeeze the particles in the bag so all the milk has gone through. Continue to repeat until you’ve gone through all of it. It is not hard but the whole process scarily made me feel like I was squeezing a cow’s udder to get milk. Not that I’ve ever done that before but you will know what I mean if you try it. I tasted the milk to make sure the taste was to my liking. If you want to add more cinnamon and nutmeg to taste you can. I made two batches of almond milk and it filled about 6 mason jars. I put it in the refrigerator. No idea how long it will last in the fridge but I have a feeling it won’t last long in our house anyway. It’s so good! There you have it, homemade almond milk. Enjoy as a snack, with cereal or a chocolate chip cookie. It has way less processed junk than the kind in the carton and you will feel like an awesome person for making it yourself. Did you ever think it was this easy to make your own almond milk? I sure didn’t! Have you ever made your own almond milk? What did you think? Easy or hard? Is this something you would consider trying? Awesome post! I make this all the time in my Vitamix and love it. It’s so much better for you and a heck of a lot cheaper than buying store bought soy or almond milk. Totally. I’m a huge fan! Do you still need to use a mesh strainer if you make the almond milk in your vitamix? Maybe I’ll try to make this tomorrow ! Do it and let me know how it turns out! Yum! I just made almond butter for the first time not too long ago….almond milk is next on my list to try!